Steven (Chicagoland, United States) on 23 June 2010 in Documentary & Street and Portfolio. 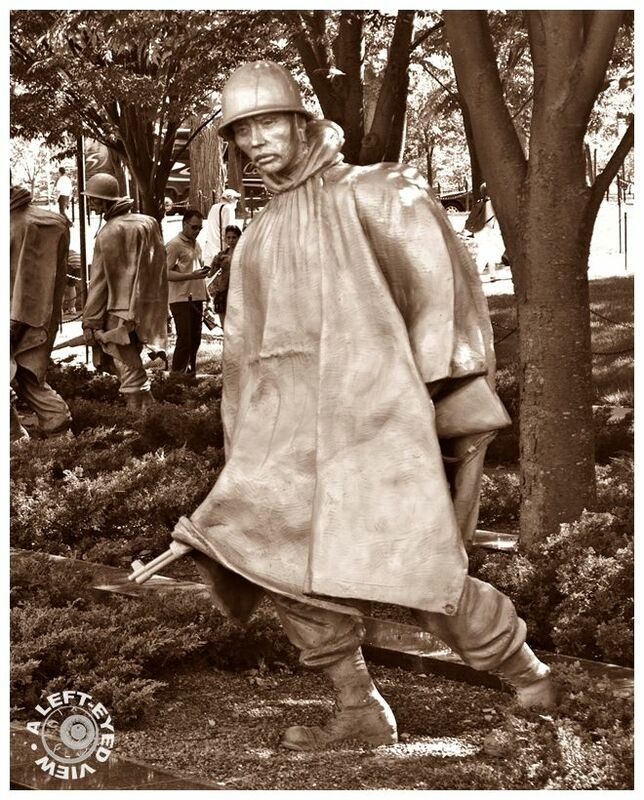 Part of the Korean War Memorial includes 19 stainless steel statues designed by Frank Gaylord, each larger than life-size, between 7 feet 3 inches and 7 feet 6 inches tall; each weighs nearly 1,000 pounds. The figures represent a squad on patrol, drawn from each branch of the armed forces; fourteen of the figures are from the U.S. Army, three are from the Marine Corps, one is a Navy Corpsman, and one is an Air Force Forward Air Observer. They are dressed in full combat gear, dispersed among strips of granite and juniper bushes which represent the rugged terrain of Korea. When walking around this memorial, I have to admit it was a bit haunting seeing these statues, this one in particular with his blank stare. And I could only think of what war did to these men. Photo captured on May 5, 2010. Great capture, no one will know what this soldier was thinking about.. These statues portray such emotion. Great frame; Greta processing ! I understand your thoughts, these lively statues evoke strong feelings. Excellent isolation of this particular part of the memorial; seeing the blank stare and wondering what's behind it brings this to a very human level of awareness. Very nice toning, it helps to create the sombre mood needed when surrounded by these statues. An excellent shot of this war weary fellow. This is such a fine monument. Your feelings exactly match the ones I had when visiting this Memorial. It is an amazingly effective Memorial. Thank you for this, Steven. Superb serie and beautiful photo. The composition is excellent. Have a good afternoon Steven. I feel like I am there, like I could reach out and touch him! This is Superb! Very nice work! So touching . . the sepia treatment works well for this, I think. Terrible.. you feel for this poor man.